There is no straight in fly casting! A long time ago it was said, that a proper fly caster would have to move his rod tip along a straight line path (SLP) during the accelerational part of the fly cast in order to shape tight loops. Over the time this SLP concept was written down to be the theoretical ideal for proper fly casting. It took place in many books, videos, articles, websites, fly casting lessons and fly casting discussions. "In fly casting there is no straight." One chapter of that site is about the Straight Lines Rule. This is the chapter offering some conclusions I don't agree with. "If the rod tip always moved in a perfectly straight line life would be easier and simpler but sadly the SLP is a just a handy ideal. In reality you and the rod tip move in a mixture of curved and straight lines. We pull the rod along in a straight(ish) line (called translation) and then we rotate it (rotation). A casting instructor will tell you you to rotate late in your casting stroke, to delay rotation as much as possible." Well, I teach proper fly casting pretty different here. I don't want my students to DELAY the rotation of their rod, but position it precisely at the right time. What the right time is, depends on the desired loop shape in the first place. Often it for sure isn't the tightest loop possible! But let's assume we want to shape a pretty tight loop matching our current fishing situation. Here is a quick sketch of the typical rod tip path and position of the unrolled fly line of many expert fly casters I have video taped in order to analyze all details. Simply the SLP rule (blue path in my sketch) would cause the fly line to often hit the rod at some point during unrolling. It's a WRONG theoretical ideal. 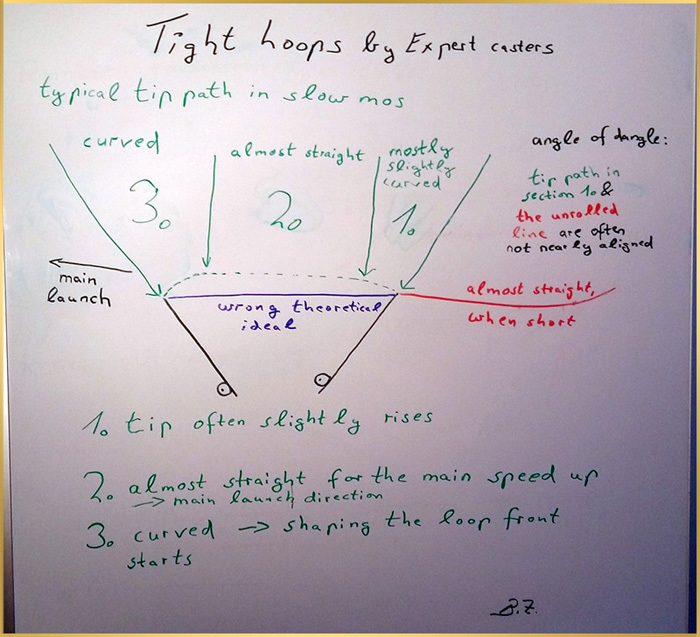 In the truth of all expert's fly casting the tip path often starts slightly rising in a light curve at the beginning of rod rotation (green path in my sketch). The tip then may be accelerated almost on a straight line within the second fraction of rod rotation. With this rod tip path the caster will determine the main launch direction of the cast. Gladly the rod tip within the last fraction of acceleration will be curved downwards again. Gladly, because this helps a lot to avoid the fly line or the fly to hit the rod. The same often holds true for the first fraction of acceleration in my sketch. This is especially important when aiming for low line speed. You know all the time when we want the cast to just unroll near the surface some feet in front of us, when gently positioning the dry fly to the fish close by. In my sketch you can also see the unrolled fly line (in the moment the next cast beginns) not to be straight. Following Mark's straight lines rule it should be straight for an ideal fly cast though. I again disagree. When casting in just the line speed I need to bring the fly to the fish, I often don't want the line to unroll along a dead straight line and I don't want it to be totally straight when unrolled. Why not? Because, this in my point of view would only be possible in a much higher line speed. Exactly what in my typical fishing situations I often don't want. Think of throwing a stone to an easy reachable target. Will you aim for highest possible speed along a total straight path directly into the target or will you just aim for an average speed to make the cast more comfortable for you? I would set my theoretical ideal within my comfort range and thus including gravity to give me a curved path into the target! For me it's the same with the fly cast. Seriously I often want a medium tight loop, an average line speed and a trajectory for the unrolling fly line, which isn't straight. Casting in medium line speed means the fly line will be pulled down by gravity to some degree during unrolling. Oh, that by the way does match with the slightly upward main launch direction in my sketch again. Though I usually don't want to cast my forward and back cast precisely on a straight line, but slightly STARTING to unroll above the straight line between the unrolled back cast and the unrolled forward cast. In the final part of unrolling it then again may hit that straight line with the line end. Let me give you another fine example, why there is no straight in fly casting! "Let’s consider a Pick Up And Lay Down cast. Imagine ten metres of your fly line is lying on the ground in a perfectly straight line out in front of you. Your rod tip is held low and the rod is in a straight line with the fly line. As soon as you start to lift the rod all of the fly line starts to move. Why? Obviously, because there is no slack in the line." The PUALD cast indeed is a cast we all use very often in our fishing! Now, if the hole fly line outside the rod tip is straight in the beginning of that cast, it means the rod tip touches the ground. Because otherwise the line just in front of the tip won't be straight. That means, if Mark wants to unroll the back cast in a straight line with the unrolled line lay out, the back cast should be aimed to unroll on the ground behind his position, right? I am pretty sure he will instead position the back cast high upwards. Now let's assume he wants to shoot line in the delivery shoot afterwards. He then maybe will allow the line to sink during unrolling of the pick up back cast, because the unrolled line then will match better to be in a good position with the (upwarded) delivery shoot (forward cast). So, what was the theoretical ideal here - a straight fly line kept unrolling on a straight line? No, not even close! All in all I recommend to let go such theoretical ideals, because they mostly are wrong in regard of the desired big three in our fishing situations. Instead you may want to match all three of them precisely with whatever you need to gently present your fly to the fish. Remember, the tighter your loop will be, the easier your big fly may end up running in the rod tip never reaching the big fish. In addition the more speed your fly will have when entering the surface, the easier you may spook the big one! Maybe the only moment in fly fishing, in which my line truly gets straight for a moment (and when that indeed seems to be an ideal) is, when that big fish takes my fly and I set the hook. I've done it a few times and I hope it happens to you too in your next fishing adventure! Great week to all of you. P.s. : Now that was a somehow different point of view about straightness in fly casting. Still Mark's website is well worth to read your way into it. Lots of properly put key points in it!